Great news worth celebrating! Cart2Cart expands the possibilities for password migration during the automated replatforming. Migrate customers’ passwords to Magento 2, OpenCart, WooCommerce, PrestaShop and other popular eCommerce solutions choosing the Free additional option. How will your customers react once your enhanced website goes live? They will be impressed with the highest quality online store they would love to make purchases from. Surprised? Indeed, there were no interruptions in the old store performance (Cart2Cart would become your secret explaining this). Let’s delight them even more by migrating customers passwords from the old shopping cart. Show your care, prove you value their time and guarantee the excellent service. For automated migration via Cart2Cart, the feature has been available for some of the eCommerce solutions pairs, yet the list has been significantly expanded. Especially for passwords migration to OpenCart. The number of Source and Target carts that support password transfer has been increased. We’ve added a couple of free plugins to ensure secure and accurate passwords import. Check the full list of shopping carts where passwords migration is supported by visiting Cart2Cart Password Migration Page! Still believe that migration from one shopping cart to a more robust one would cause a lot of additional headaches? At Cart2Cart we work day after day to make the transfer effortless for you and most pleasurable for your clients! 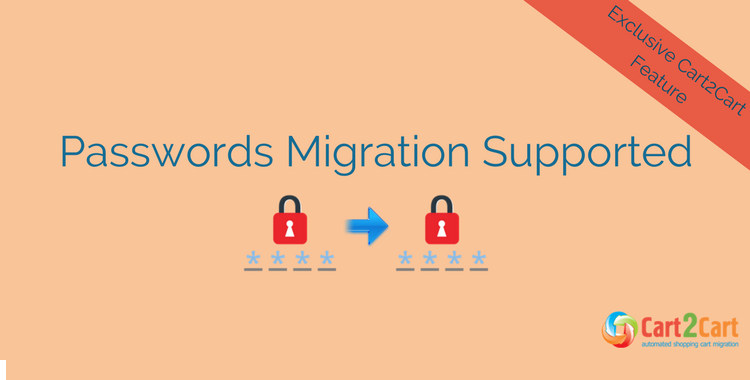 Before kicking off the Full Import, try the service and the passwords migration option with Free Demo. How about getting your customers’ appreciation now?